There are many uses for coconut, from cooking and eating, to aromatherapy and even toothpaste. With all the wonderful benefits one can obtain from using this 'wonder fruit', it's only logical that coconut is often included in skin moisturizers. Moisturizers with coconut can help to deal with skin conditions and promote a healthy hydrated complexion. Tropical Traditions Organic Virgin Coconut Oil Moisturizing Creams are all-natural products which come scented or unscented. Consumers who purchased the creams on the Tropical Traditions website, agree that they are highly moisturizing and effective. The creams are concentrated and great for those with severely dry skin. Eminence Coconut Age Corrective Moisturizer helps to tighten sagging skin, promote skin elasticity, and delays visible signs of aging. It is one of Eminence Handmade Organic Skin Care of Hungary's top ten best selling products. 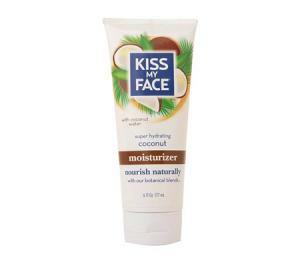 Kiss My Face Super Hydrating Coconut Moisturizer contains coconut water, coconut oil, and grape seed oil. St. Ives Naturally Indulgent Coconut Milk and Orchid Extract Body Lotion was included in a July 2011 Editors' Favorites list in Allure magazine, where it is described as being a "bonus on humid days." The lotion is paraben-free and quickly absorbs into the skin without leaving a greasy residue. Alba Botanica Natural Hawaiian Body Cream Nourishing Coconut Milk has tropical emollients from coconut, Shea, kukui, and macadamia. Women's Health recommends this product for its powerful hydration properties in its 5 Steps to Glowy Skin article. Mountain Ocean Skin Trip is blended with coconut oil, aloe vera, and lanolin and reduces the natural evaporation of moisture from the skin, a feature particularly beneficial for dry skin. In a Town & Country article, designer Asia Baker lists this product as her favorite body beauty product. Hempz Fresh Coconut Watermelon Herbal Body Moisturizer is enriched with 100 percent pure natural hemp seed oil. It includes calming chamomile and nourishing avocado extracts. The vitamin C-rich fruit watermelon is also included, making for an antioxidant-packed moisturizer. Epicuren Kukui Coconut After Bath is designed to prevent premature aging while moisturizing. It has been featured in Marie Claire magazine as a product used in some of the most chic spas in the world. The Body Shop Coconut Milk Body Lotion is listed as a best seller on the company's website. The product is lightweight and leaves a light coconut smell behind after application to the skin. Coconut oil can be used to help the skin and improve the overall health of the body in many ways. It can be applied to affected areas for moisturizing, or it can be ingested to receive benefits. Coconut can help to treat eczema by functioning as an anti-inflammatory, which soothes the itchiness and soreness accompanied by the skin condition. Coconut oil possesses the ability to act as an antibacterial and anti-fungal agent, which can be beneficial when applied wounds or burns. Not only will this help to keep the skin clear of fungus or bacteria, but the antioxidants in the coconut will help to speed up the healing process. Coconut oil contains both ferulic acid and p-coumaric acid which assist in keeping the skin looking younger and more firm. The fat from coconut is considered a good fat , along with omega-3, and can aid in providing and replenishing nourishment to the skin. Although traditional sunscreen is used often to protect against sunburns, coconut oil can be used as well. Coconut has a SPF of 10, so for those who like to opt for a more natural approach to sun protection, using coconut oil is an option. Coconut oil is powerful on its own, but when combined other with moisturizers it provides an added boost to skincare. Not only will you be fighting wrinkles with the use of coconut, but you will also help your skin be resilient with continued use.